Home World Airport Landings - Have You Ever Faced 'REAL FEAR'? Airport Landings - Have You Ever Faced 'REAL FEAR'? After a month in Shanghai, I'm now back in warm Singapore. I must say that as usual, the SIA pilot did a wonderful job on the landing at Changi... but sometimes even the best pilots can struggle if the airport is not very well designed. 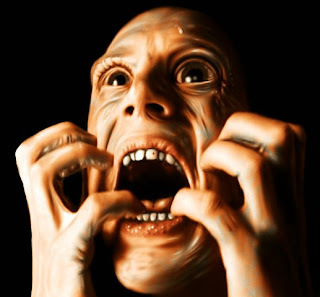 As a frequent traveller who endures hundreds of take-offs and landings, I have become somewhat immune to the fear - unlike driving a car, when I fly my life is in the hands of someone else... and I've always been taught to only stress over those things that are within my control. But over the years, I've had my fair share of 'life doubting' moments - from almost running off the edge of the old Hong Kong airport into the bay, to the landing gear not working on the approach to the runway in Xiamen (to name just a couple). 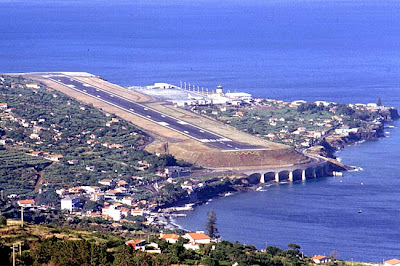 "Travel and Leisure" has come up with the following list of the world's scariest airport runways. Whether you are a religious person or not, perhaps if you are taking a flight to one of these locations, you might want to start praying. 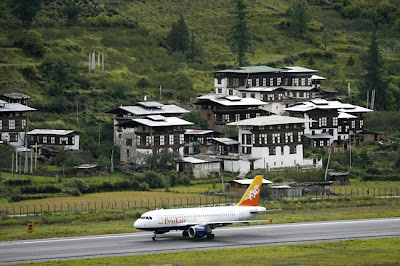 Tucked into a tightly cropped valley and surrounded by 4900-metre-high Himalayan peaks, Bhutan's only airport is forbidding to fly into. It requires specially trained pilots to manoeuver and land through a channel of tree-covered hillsides. 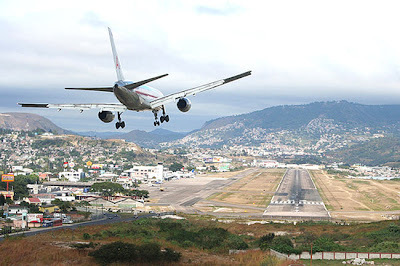 The length of the runway is just 2180 metres which is fine for small or medium-size jets, but as the second-busiest airport in the Eastern Caribbean, it regularly welcomes wide-body jetliners like Boeing 747s and Airbus A340s which fly in low over Maho Beach and skim just over the perimeter fence. Located smack in the center of two overlapping air-exclusion zones, Reagan National requires pilots flying the so-called River Visual into the airport to follow the Potomac while steering clear of sensitive sites such as the Pentagon and CIA headquarters. 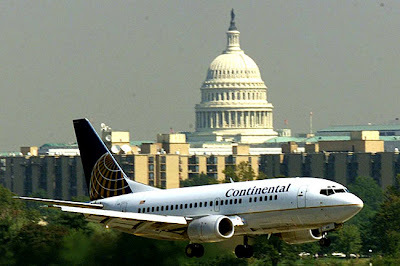 On taking off, pilots need to climb quickly and execute a steep left bank to avoid flying over the White House. 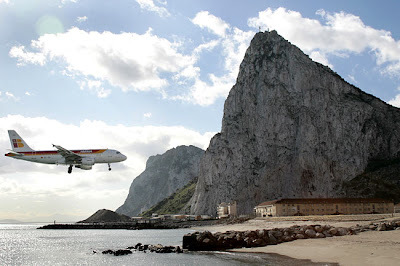 Pinched in by the Mediterranean on its eastern flank and the Bay of Algeciras on its western side, the airport's truncated runway stretches just 1828 metres and requires pinpoint precision. The 399-metre-long runway is perched at the edge of a couloir at 2300 metres. You drop down the face of a 609-metre cliff until you start flying. Says bush pilot Tom Claytor: "The rule in the mountains is that it is better to take off downwind and downhill than into wind and uphill, because in Lesotho, the hills will usually out-climb you." 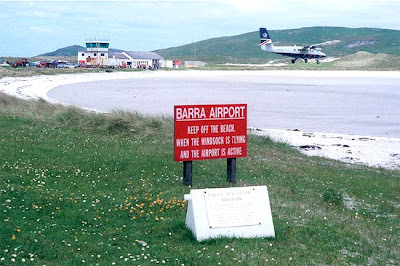 The airport on the tiny Outer Hebridean Island of Barra is actually a wide shallow bay onto which scheduled planes land with the roughness of landings determined by how the tide went out. 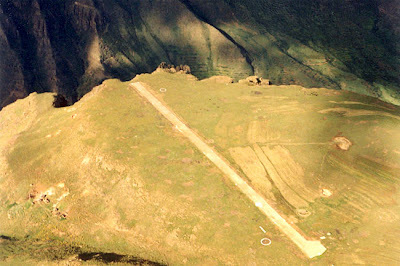 Having negotiated the rough-hewn mountainous terrain, pilots must execute a dramatic 45-degree, last-minute bank to the left just minutes prior to touching down in a bowl-shaped valley on a runway just 1862 metres in length. The airport, at an altitude of 1000 metres, can accommodate aircraft no larger than Boeing 757's. 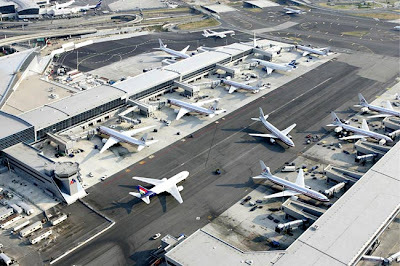 Pilots have to avoid interfering with flights into New York's two other close-by airports, LaGuardia and Newark. 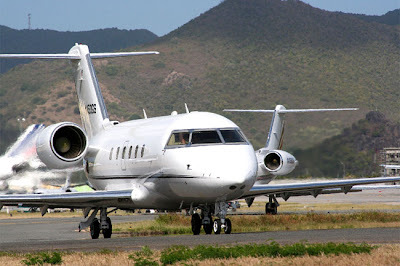 Set up in 1964 as a noise-abatement measure, this approach forces pilots to have a reported 457-metre ceiling and a eight-kilometre visibility before lining up with runway 13L and the waters of Jamaica Bay. 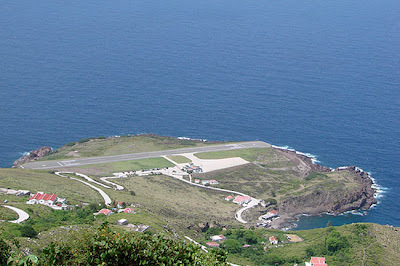 Wedged in by mountains and the Atlantic, Madeira Airport requires a clockwise approach for which pilots are specially trained. Despite a unique elevated extension that was completed back in 2000 and now expands the runway length to what should be a comfortable 2743 metres, the approach to Runway 05 remains hair-raising. Pilots must first point their aircraft at the mountains and, at the last minute, bank right to the runway. Perched on a precipitous gale-battered peninsula on the island's northeastern corner, the airport requires pilots to tackle blustery trade winds, occasional spindrift, and their own uneasy constitutions as they maneuver in for a perfect landing on a runway that's just 396 metres long.